Two anonymous figures looking out to sea, a shared experience. We share it too and yet they will be forever a mystery to us (presumably, unless there is a reveal). So very evocative and the black and white works perfectly to highlight the geometric shapes and patterns and to frame the couple. Oh my goodness, perfect! I agree with everything that Ms. Wunderkamera says above. Terrific photo. Thanks, Barbara. Trust Wunderkamera to steal your words! All these lovely echoing shapes and shadows, and the couple in silhouette on the bench, dramatically framed by the large entrance. We can’t help but wonder who they are, what they’re talking about. There’s a sombreness to the scene. A chill — maybe because we can see they’re wearing coats. Or not summer wear, at any rate! I like the blown out overexposure of the water at left, which further contrasts with the couple, and that little patch of brightened brick in the midst of the otherwise dark floor. As with Elizabeth’s photo, even though there’s lots to attract the eye here, we know the couple is the focal point. They seem tiny relative to the building and the body of water they’re watching — which is, I assume, the point? Or that’s one interpretation. Wouldn’t you just love to know what they are talking about, or not. Maybe it’s just about ‘being’ together. Beautifully framed, Carin. A perfect shot .. tells lots of stories and holds one’s attention … from angle to angle. Great! 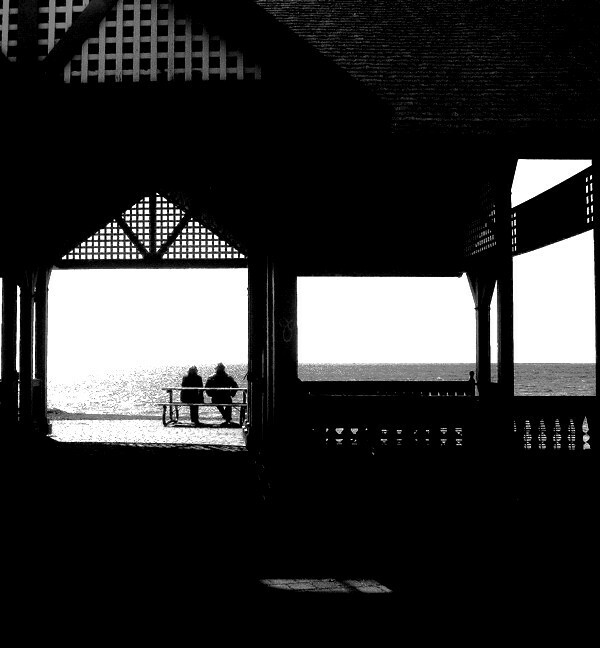 I want to be there–both sitting on the bench, and behind the couple watching them from that vantage point. That makes perfect sense to me and yet I wonder how many people wouldn’t think about the pleasure derived from just watching someone else, or at least noticing them. If only to understand ourselves better in a way and then translate it somehow. Because I think that’s a big part of it. That and plain nosiness. haha!